Take a look at the following analysis, please. I'm having problems with packet loss from time to time. The communication between the server and me is in yellow. The first blue entry showed when the packet loss started. Can you think of any reason why suddenly the destination address changes to 0.0.0.0? Don't use screenshots in Questions, publish capture files at Cloudshark or at any general-purpose file sharing service, and provide login-free links to them. As one of the addresses is public and the other one, which changes to 0.0.0.0 at a certain point, is a private one, I would expect that there is a NAT device between the capture point and the Internet and that the software of this device is broken. 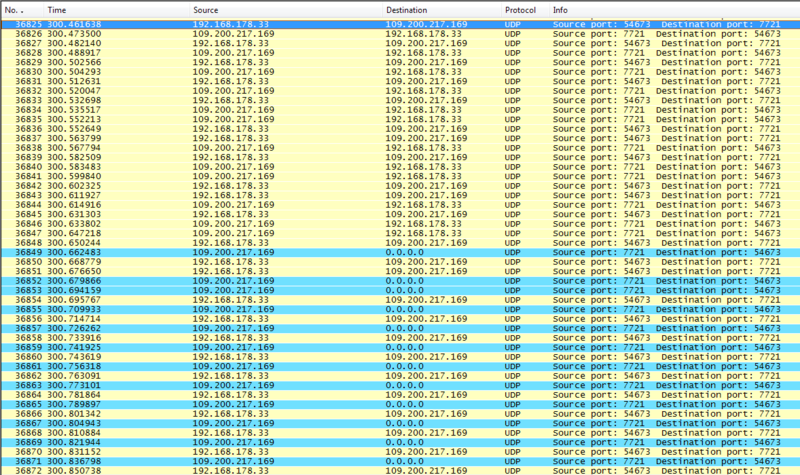 As the screenshot does not show MAC addresses, nor does it show the UDP payload, it is impossible to say more. Added link to capture file. Is the FritzBox firmware up-to-date?